[product design features] ◎ Table cloths - All are easy to clean, easy to dry cotton cloth / ancient cloth / section gauze sewing. ※ In order to take the best area, the figure may not be the same when the fabric is cut. Please be careful when buying! ◎ Cloth - The lining will not be soft and there is a certain level of protection. ◎ bag cover - pressure buckle is not afraid of washing rust, the use of more hygienic and convenient. ◎ Inside - waterproof and splash-proof cloth, stain resistant and easy to clean! ※ It will be very clean to get dirty immediately with a paper towel. ◎ Each piece will be slightly different in length, can put about 25 cm below the chopsticks, spoons, forks, straws, fruit dessert fork spoon, straw brush ... and so on. 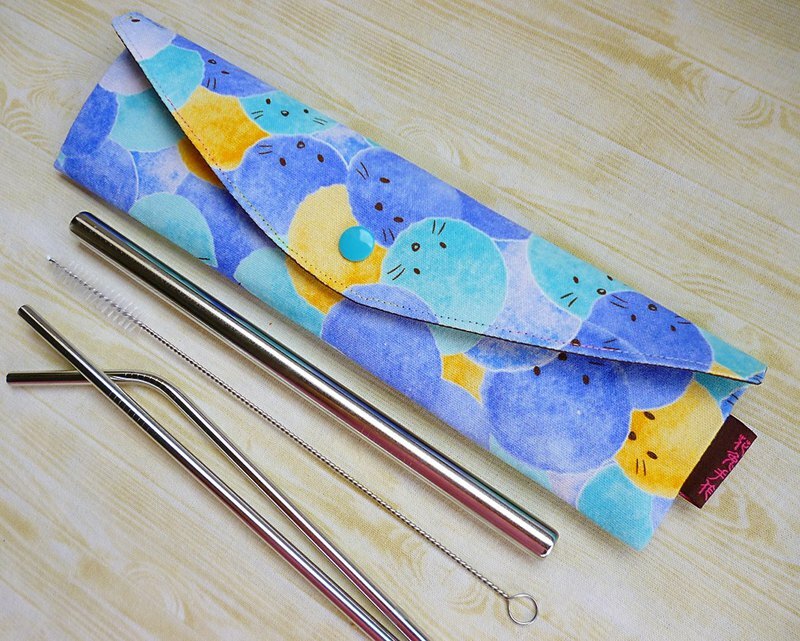 ※ The material of this cutlery bag is selected when the rabbit is about five or six years ago as a gentle tableware package. Share the idea of the blog, and later, many hands make reference designs. ◎ When a person is at work or in class, he or she can fully include the cutlery needed for brunch or lunch and dinner. ◎ go out to eat, help the other half to prepare a pair of green chopsticks, one pair, more intimate. ◎Of course, it can also include whole family's environmental protection chopsticks or various environmental protection straws. **A total of three colors for selection**～ I hope all of you can make a bit of a drop in environmental protection and be healthy. ※**This item is sold as a tableware only**,**No other tableware**! ※**There are any questions or special attention to details**,**Please ask in advance before ordering clear**,**do the next single action**! **so as not to abandon the single single regret**,**cause unnecessary misunderstanding or trouble both sides**~ [Materials and washing] Cotton, water repellent cloth ◎ After daily meals, wipe/wash chopsticks with wet wipes, wipe dry chopsticks with a cloth towel, and place them in a cutlery bag. ◎ If you feel that the cutlery bag has a taste or is wet, wipe it with a wet wipe, or dry it with a food-grade baking soda solution, and spread it to dry (with quick-drying material inside). ◎ Waterproof, stain resistant, and easy-to-clean materials are used in the interior. If the utensils are cleaned after being put in, the tableware package may not be washed every day. ◎ If the cloth is heavily soiled, wash it with a neutral lotion or house soap. 【size】 Flatness: The center of the bag body is about 7~8cm high, and the length is about 26~27cm (the error is about 1~2cm) (If you are concerned that it will not work, please inform the flower rabbit first of all about the size of your tableware. The rabbit will help you find the actual size of the tableware!) 【Flower rabbit hand made original intentions and small 叮咛】 ◎ The transmission of hand-crafted works and love is the original intention of selling rabbit hand-made works. ◎The sales income is spent on the feeding and rescue waves of the rabbit. ◎We would like to make the world a better place with the power of bean sprouts. ◎ Manual stitching may cause some imperfections. ◎ Each person's screen settings are different, so the actual product and the screen display may have slightly different shades of color. ◎ Hand-made, for the perfectionist of color and workmanship, please think twice before buying. ◎Saturday for the family day and material procurement processing schedule day, not shipped (except for special orders). ◎If you do not have a full-time non-urgent order, if you have a specified time limit on the arrival date, please confirm it before placing orders. Do not order directly, and you will not be able to obtain a reasonable meeting. ◎ Non-24 hours online, please contact us if you have any questions. Wait patiently. Rabbits will reply and deal with them in the first time!